Why Thomas opened that door, we may never know. It could have been something he did instinctively, some remnant of an ancient primal urge. It could have been an impulse from the depths of his brain, a half-remembered childhood memory tugging gently at his conscious mind. It could have been something he had been planning for weeks, knowing long before now that he would open the mysterious door at the first available opportunity. It could be that he was not human at all, with none of the caution and instinct for self-preservation humanity brought, but a sophisticated android with a pre-programmed agenda for door-opening. There really is no way of knowing without some kind of detailed neural scan. Maybe his name wasn’t even Thomas. After all, guessing someone’s name based on their appearance is often a matter of pure chance. Suffice it to say, there was a human, or humanoid figure of some sort, opening (or appearing to open – such tricks of perception are possible) something that looked very much like a door, but don’t hold me to that. After all, who is to say what reality is, really. There is a man, or possibly a man, or, well, I should say what seems to be a man given the current data, starting to laugh, or at least it appears he is laughing, after having read this. I'm not entirely sure he made it all the way through, though - he could have skimmed. He might have missed some minute detail. There's just no way to know. He is definitely laughing, though. I'd say I'm ninety-five percent positive. Did Thomas have an appearance? I don't remember appearance being mentioned. How could we guess Thomas's name (assuming that Thomas is his name)if he didn't have an appearance? Does Thomas exist at all, even in our imaginations? In any case, do we need an appearance to imagine a name? Perhaps the name came first, and everything else followed (whatever the something else was). Who's to say what an android is, really? Should we presume? I don't know why I suggested that. I don’t know why I said you did. Attributing motivation is tricky. The first thought I had when I read the heading was Borges. Jorge Luis Borges often, or possibly always, wrote his stories as if he didn't understand what was happening or what it meant. For Borges, it was how he wrote well, really well. 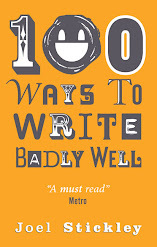 While usually considered easy to do, consistently writing badly is a talent. This wonderful array of examples can only encourage those of us who aspire to mediocrity and below to work tirelessly at our craft. Thanks. "Ozymandias, is that you?" the being we have elected to refer to as Thomas for convenience wandered allowed.